Gold Industry Group Company Secretary Bron Suchecki, spoke to PCF Capital Group Managing Director Liam Twigger following this year’s Precious Metals Investment Symposium. Liam shared some key insights from his journey in the industry and the recent launch of new company FutureGold. What does PCF Capital Group do? We are corporate advisors that specialise in mine sales and are the number one broker and advisor in Australia in that area, which is about 60-70% of our business. We also arrange project finance and project related mergers and acquisitions – we just raised $150m for Gold Road Resources and have done about $2.5 billion worth of deals over past 20 years we have been in business. What are the ways companies can raise money and the challenges in financing a project? Companies can raise money via traditional equity or debt but one of the biggest challenges with juniors in particular is that everyone wants a world class project. This just isn’t possible as they are few and far between, and furthermore you don’t need a world class or “Hollywood” project to be successful and to have a platform for growth. If you get your timing right – and in my view, 90% of value is often achieved by getting your timing right, you can get by with tier 2 or tier 3 asset i.e. look for a Bart Simpson rather than a Brad Pitt. Evolution Mining is a great example of a company that started with a number of tier 2/3 assets and backed themselves to lower costs, find more gold and get their timing right. I think you could do a lot worse than following the Evolution Mining blue print. Where does the money come from and who are the typical investors? If projects have production or a clear pathway to production then they can raise equity but if the company is in exploration or early stage it is very hard. Retail investors have left mining, particularly in Canada and the US, where cannabis and crypto has competed for their attention. So explorers or juniors look to “big brothers”, that is, larger companies, to take a stake in them. After the GFC the Australian market recovered quickly, cleaned itself up, a lot of management teams were changed out and shifted focus on returns to shareholders. That is why Australia has the standout best mining companies in the world at the moment, certainly in the gold space. This is reflected in the fact that for the first time ever, we have had Canadian companies look to dual list on the ASX to get access to our pools of capital. What is the most memorable deal of your career? My most memorable deal was actually my first deal 20 years ago. I came out of the ashes of Bankers Trust and created PCF but we had no brand, no balance sheet and no backup. We were given a chance by Randgold and Mark Bristow to sell a mine they had in Mali, a very difficult asset. We worked very hard and sold it to Resolute, and it is now the best performing asset in their portfolio. You mentioned asset divestment, why would a company sell a project? It depends where a company is in its life cycle, as you move up from being a tier three to a tier two to a tier one company you need different assets – again, you can’t start with Brat Pitt, instead look for your Bart Simpsons, add value, sell them and use the capital to get something better. How did you end up in this industry, were you always interest in money and finance? I left home when I was 15 years old and went to the UK to play soccer professionally and I was good but not that good. I came home, studied economics and was going to join the army but changed my mind and got a job with Robert Holmes à Court (I had no idea who he was) in their treasury department and that was how I started in finance. How have changes in technology impacted the business? Technology makes process more efficient. 10 years ago, we recognised that there were a lot of smaller projects that we could find buyers for, but just didn’t have the time or arms and legs to manage the processes. Hence we created MinesOnline.com – an eBay for marketing mining projects. It’s been a great success with over 40% of projects that get posted on MinesOnline.com get sold within six months. 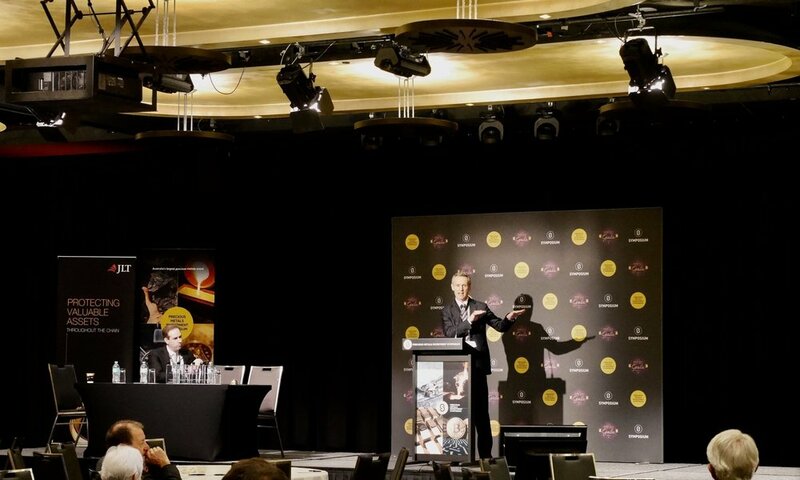 You spoke at the Precious Metal Investment Symposium about “the next ICO that will unite gold and crypto markets”, can you tell us more about FutureGold? FutureGold is a new company we have formed that will seek to issue crypto security tokens to raise up to US$250 million to fund emerging gold companies. Ideally it will hold around twenty investments and we are looking to secure royalties or buy gold streams from early stage to developers and even some producers. We see it tapping into a new demographic that doesn’t want to invest in conventional stocks and shares and has a high distrust of large institutions that have broken their social contract with the community through greed and avarice. It also provide juniors with an alternative and competitive source of capital. Why do you support the Gold Industry Group? As an industry we have to work hard to profile and promote gold mining and counter the naysayers who take cracks at mining. I am a big soccer fan, having been a director of Football West, which runs soccer in Western Australia, for the last ten years and Chair for last five – that is a big part of my life. READ MORE INDUSTRY Q & A’s.